The replacement MT01 finally arrived from Haikelite. Not sure if any one else found that most regular non-protected 18650s are still to long for the battery tube in this model, but after cutting off the springs & adding three tiny brass washers to the back PCB to make the battery tubes long enough to work with 18650 cells, the replacement works great. I checked the LED board, and everything is good there, but the emitter is just half dead. Should i try contacting Banggood or Hakilite on this? Update: – Dale from Haikelite contacted me via DM, and is working to offer to fix this issue i have with my MT01. (will post updates here on it when i hear back & on what they do for me. Update, March,1,2018 – I am still waiting for Haikelite to fix this issues, still nothing. UPDATE, March.25,2018 – So its been past 2 months now with a useless dead, failed MT01 i purchased not long ago, and Haikelite did NOTHING to fix my issue, all they did is give me the run-around, claiming this “ Dale “ person was supposed to contact me, (of whom never did after months ago,) and they kept delaying any fix for the faulty MT01 i bought from them through Banggood. As mentioned above, the XHP50.2 emitter burned out two of its four dies, then the light stopped working completely not long after. I tried another emitter, (a new XHP70 i had) but the light failed to turn on at all, so i guess the driver failed too?? Either way, the months passed and i still have a dead MT01 taken apart in a box that is basically junk. The last message that HaikeLite Official here on BLF sent me 2 days ago was: “ Could you please provide your banggood order number and email address? We send the XHP50.2 emitter with MCPCB to banggood, They will arrange the shipping to you” .. REALLY?! all they needed to do months ago is send me the parts directly or a replacement light, but NO, they come up with that idea? SO i have red-flagged Haikelite as a flashlight company with POOR to ZERO customer service. I will never buy another light from them, and will never recommend Haikelite to anyone, as if their light fails, they will likely get the shaft & BS that i did. I have had far better customer service from other established brands of lights i had an failure with before. Olight, Thorfire, Manker light, all have great customer service and will help their customers quickly, Haikelite will not. They claim they want to build great lights and succeed as a flashlight company? well they better fix their horrible lacking customer service first before i will ever buy again. ***UPDATE, March,26,2018 – Haikelite USA have read my upset and distaste for the delays and poor service on my dead MT01, so the last message they said they will ship a replacement light tomorrow. (unsure from where or how long it will take, but lets see if they live up to their promise this time, and will wait up to another month to see if i receive anything. I will post here again with an update once i do. Man , if I had your skills I woudn’t even buy any flashlights . I do hope you get this resolved to your satisfaction . I don’t expect much from Hakelite or Banggood, so either way i plan to swap in a nice tinted MT-G2 or even a XHP70. Update: Dale from Haikelite contacted me via DM, and is working to offer to fix this issue i have with my new MT01. (will post updates here on it when i hear back. 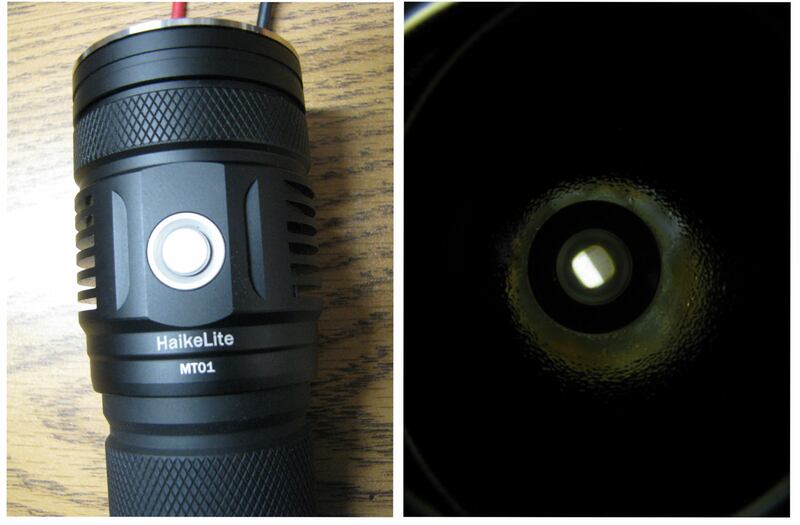 UPDATE: – - I still have not received any fix or reply for my dead MT01 light from Haikelite.. I hope they fix it mate! Just a defective XHP50 LED. half the dies stopped working. (as seen in the photo above) it began to flicker then went dimer, then i noticed only have the LED was lighting up in all modes. I got a message from Haikelite, and they said the first batch of XHP 50.2 LED’s were “unstable” and they woudl take care of the problem, and never heard anything back after.. Contact Haikelite USA on here, he is the USA and Canada dealer. Says his customer service is second to none, give it a try. I don't get it. From what I read here, it has been one month and six days since they offered to help and still nothing? I was reading threads where I thought they had the best customer service around. Could be the old "keep quite and say nothing in hopes they go away" deal going on here. I don’t get it. From what I read here, it has been one month and six days since they offered to help and still nothing? I was reading threads where I thought they had the best customer service around. Could be the old “keep quite and say nothing in hopes they go away” deal going on here. That’s correct. I sent them back another reminder to the message that Haikelite sent me to remind them that i still have a MT01 that has a defective emitter. It may be that they don't want to talk of fear that it will open up a whole can of worms with these emitters and we know now many of the XHP's are faulty. It may be that they don’t want to talk of fear that it will open up a whole can of worms with these emitters and we know now many of the XHP’s are faulty. their silence and in-action on fixing my dead MT01 will only lead to my distaste in their products & customer service. (bad reputations of manufacturers spread fast if they don’t stand up to their products when they fail. Disappointing really as they talk good on one thread here at BLF and then totally ignore your defect. It just doesn't make any sense to me. I wonder if your emails are all of a sudden ending up in their spam folders? This has happened to me now and then. Disappointing really as they talk good on one thread here at BLF and then totally ignore your defect. It just doesn’t make any sense to me. I wonder if your emails are all of a sudden ending up in their spam folders? This has happened to me now and then. They were actually DMs they send me here on BLF. Nope you've never contacted me nor have I contacted you. Unfortunately I do not have the parts for that light or I would just ship you one. Getting anything from Haikelite right now will be next to impossible because of the Chinese Holiday. I can't even get A shipment that I desperately need of a totally new product. But that is the culture so I live with it. I will however write down this issue and take it up with Dale in our next meeting. If nothing else if he can ship me the part I can forward it on to you. Or he can ship it directly. Either way I will find some kind of result for you. Nope you’ve never contacted me nor have I contacted you. Getting anything from Haikelite right now will be next to impossible because of the Chinese Holiday. I can’t even get A shipment that I desperately need of a totally new product. But that is the culture so I live with it. Someone from Haikelite did contact me via direct message here on BLF. (i can screenshot the messages he sent me and my replies if required. My apologies, i did not notice that it was a different account until you mentioned it. Thank you for the prompt reply to this matter. (his last rely was over a month ago, & did not reply to my last to messages i sent. During the Holiday it is a bit harder for even me to reach him but I will find a way to ge t this resolved. This is at the top of my list. Once I have all the logistics for each product worked out in shipping all Canadian customers will reflect on my company so this has to get handled. Thank you. I appreciate your correspondence on this. Good customer service is key to keeping returning customers, and customers who promote positive feedback. (and future purchases as you have many really nice models of lights in your lineup. To me... Sales are simple... The product will usually sell itself.. It is the service the customer gets before and after the sale that keeps a customer. I am about to send you a PM.. I just spoke to Dale. Keep me posted so that I can continue to remind Dale if necessary.. He really has,a massive workload and things get mistakenly forgotten. Hello again, I sent him that email but still NOT have heard back or got any response to fixing my defective MT01.. It is now March,12018..
Dale according to Terry is just returning to the factory in china, they have had like 20 days or so holidays over there everything closed so things more or less have been standing still, we also have some issues with their group buy for the MT09R flashlight from Haikelite same thing there, no responses from Dale because its been holidays, dont worry they will start go through all mail and solve these issues and Terry will hopefully be able to sort things between them and you. Its never fun dealing with defective lights but i bet Haikelite want to get things right for you since light is under warranty and all. I am interested in the MT09R too, but going to wait before i buy another Haikelite to see what they do to fix my MT01 failure firsts.